Set on the very outskirts of the Masai Mara and on the edge of the Mara North Conservancy is this unbelievable luxury safari hideout. At Mara expeditions camp you immediately become an intrepid explorer, with so much to investigate, to learn and to enjoy. The never-ending plains become your playground and the big-hearted, ever-smiling, genuine African staff… your friends. Mara Expeditions Camp has been built on a small bend in the Ntiakitiak River where the dese riverine forest meets the golden plains. It’s a place where lion calls dominate the nights and the sounds of hippos snorting accompany each day. It’s the ultimate in African safari immersion. The Masai Mara is a powerful place in Africa where you will learn many life lessons that could change the way you view the world forever. The Mara Expeditions staff will do everything possible to ensure that you make the most of and get the most of this exquisite landscape. The guides are exceptional, the game viewing second to none and the ability to connect with the African bushveld unparalleled. Every direction you look the game is aplenty. From Thompson’s gazelle, to Grant’s gazelle, zebra, to wildebeest there is an absolute abundance of plains game! Not to mention the majestic predators including lion, leopard and cheetah that lie hidden, waiting for the right time to pounce. So much excitement, so much adventure and so much beauty all in one place! 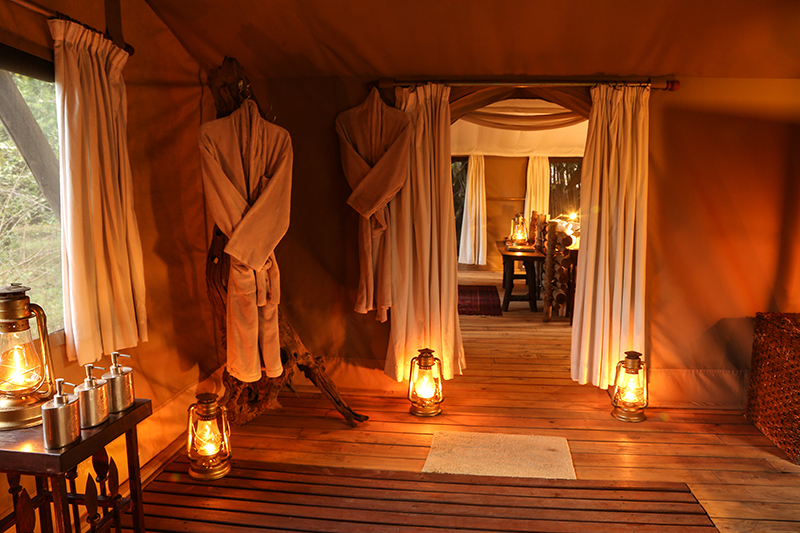 Mara Expeditions is a small and intimate camp, perfect for a romantic safari getaway or a quiet family retreat. Steeped in history and African colonial culture there is tangible air of yesteryear. Authentic in every way with every single detail considered the camp’s five custom-designed tents are a treat for all the senses. The atmosphere is one of warmth, luxury and a palpable passion for Africa. Set in amongst the forest canopy each suite boasts every indulgent amenity you could possibly wish for. Eclectically yet colonially designed, the sense of adventure and exploration comes across in all the intricate furnishings such as brass chandeliers, old Indian campaign chests, rich leather furniture and soft cottons. Essentially the guest services, facilities and overall experience are only the very highest standards that Great Plains has become renowned for. Sip on that ice-cold Pimms and lemonade, relax and watch as the sun slowly sinks down over the shining savannah and listen as day turns to night around you. The camp is temporary, transient and constructed in the spirit of mobility and non-permanence with the wilderness’s best interest at heart. In essence, Mara Expedition Camp can be completely removed and the area returned to the state in which it was found and perhaps even better. All construction is “green,” all energy solar and everything possible recycled. Again traits that are indicative of Great Plains consistent and conscious drive for sustainable tourism and protection of the beauty of the African continent. Mara Expedition Camp is primarily accessed by scheduled air transfers or private air charters. On arrival at the airstrip, the transfer to camp is approximately 45 minutes allowing time for game viewing en route. Safarilink and/or Air Kenya offer scheduled daily flights from Nairobi’s domestic Wilson Airport to the Ol Kiombo airstrip inside the Masai Mara Reserve. Set on the very outskirts of the Masai Mara and on the edge of the Mara North Conservancy is this unbelievable luxury safari hideout. Contact Iconic Africa now and let us craft the ultimate East African adventure for you.